The last week of my summer holidays is progressing nicely. I've been busy sewing, baking and of course crocheting. I started messing around with a few ideas at the weekend and came up with this little Christmas jar cosy and this stocking. I know, I know, it's only August! So why am I already thinking about Christmas? It could be the weather we've been having lately, so wet, dark and grey all the time it does feel like summer is over. 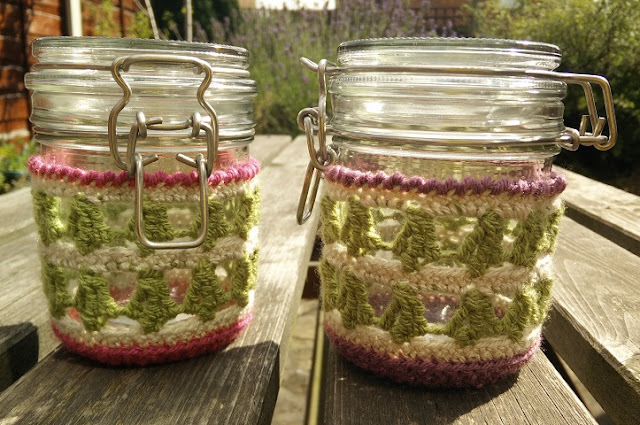 Anyway I digress, I've wasted no time in getting this Jar pattern written up with a full photo tutorial no less! You can find the pattern here. 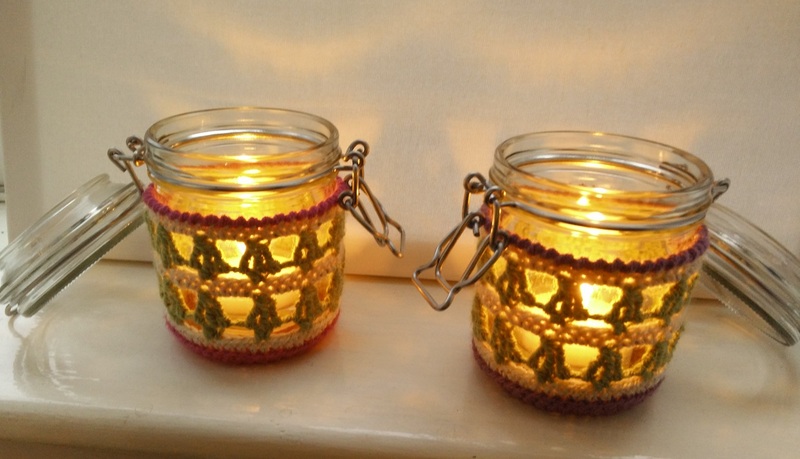 Don't they look sweet with candles in them? 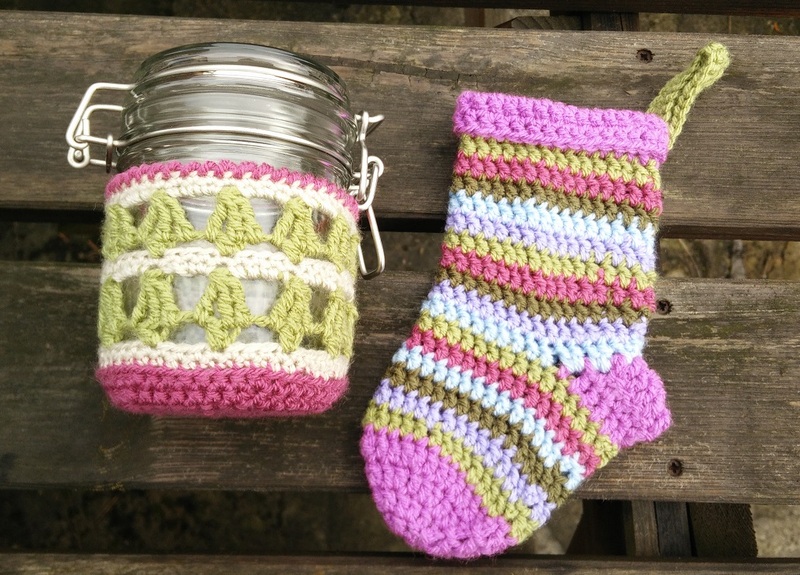 I have made them to give as Christmas presents that I will probably fill with sweets for people. I have several of these jars spare and this pattern is so quick to make, I might make a few more. If you would like to make your own jar cosies please don't be put off by some of the stitches that the pattern calls for. I've added as much detail to the photos as possible so I hope they will be fairly straightforward and when you get the hang of them they are quite easy. It's great getting started early on Christmas makes, takes the pressure off nearer the time when all thoughts turn to shopping, baking and organising. That said, there is the whole season of autumn to go first and I have lots of ideas of things to make on that theme. I have been taking a well-earned break today. This last week or so has seen me FINALLY decorating our bedroom! It's has only been planned for the last 12 months and at last I got the paint brushes out and got stuck into it. Of course it's never as simple as just painting is it? There is always holes to fill and sanding to be done and all the shifting of furniture etc etc. I am now at the reassembly part of the job which isn't simple either. We have an awful lot of clutter and tat and nowhere to put any of it so I am having a good throw-out too. 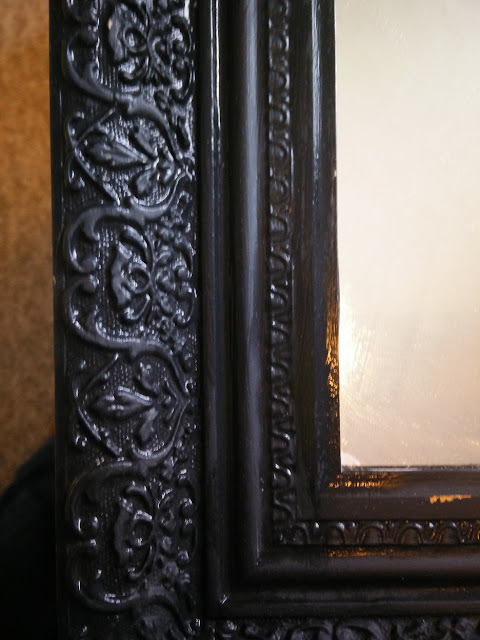 We had this old mirror up before. It's just a cheap plastic frame that I think I got from a car boot sale and painted black. 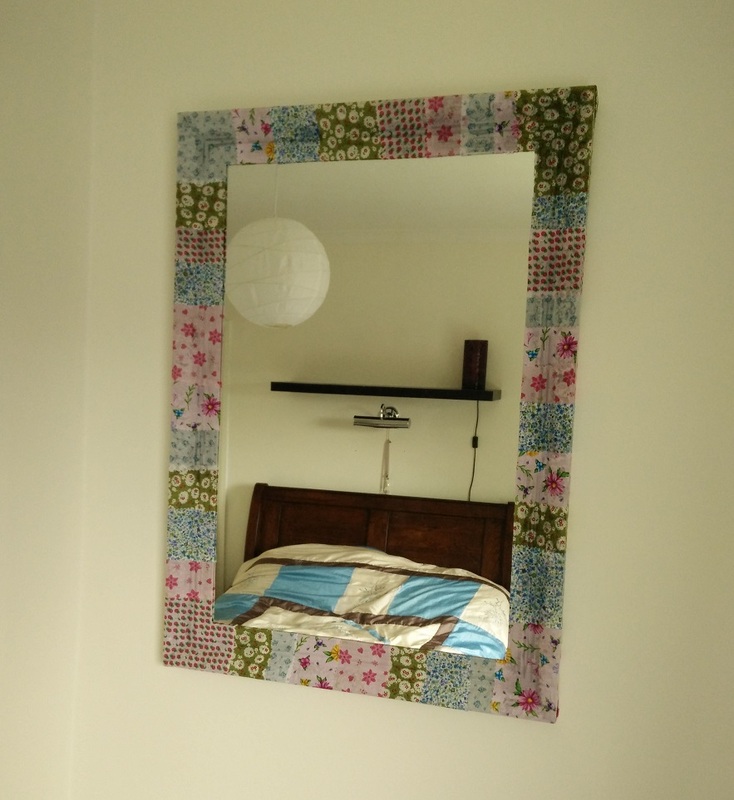 In an effort to try and make the room much cheerier and prettify it a bit, I have been thinking of ways to up-cycle it. 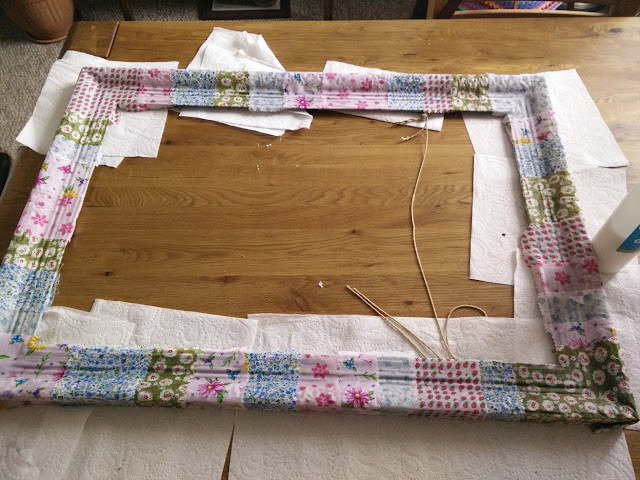 Obviously my first instinct was to yarn-bomb it and crochet a cover for the frame. I soon realised that would not be an easy job, it is a tight fit in the frame and having yarn involved would complicate things. 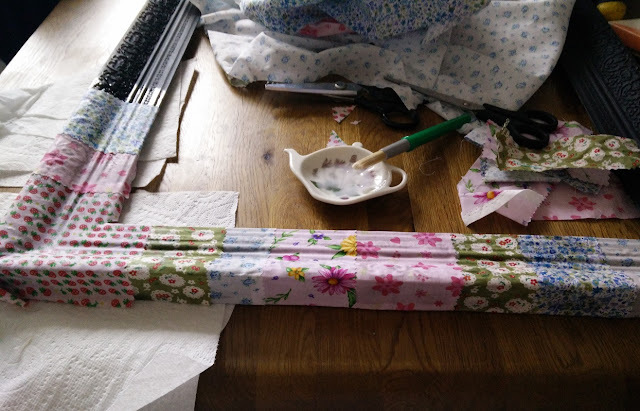 So I grabbed some fabric odds and ends and a pot of PVA glue and set to covering it in fabric, decoupage style. 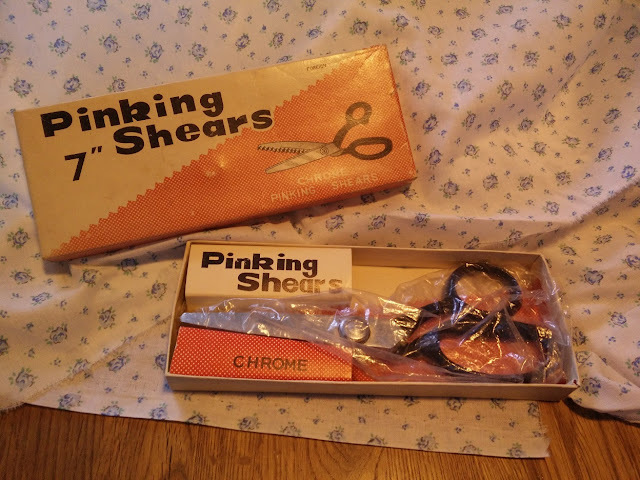 I also found these pinking shears that I got from my Granny, still neatly boxed, I love the box! Using the pinking shears on the fabric should be a nice simple way of avoiding fraying, I hope. I wasn't sure if PVA would do the job, it was taking forever to dry so I got my hair dryer out to speed up the process. It seemed to be sticking OK so I carried on. Now it's finished and up on the wall, I keep looking at it, do I love it or hate it? Is it too girly and not grown up enough? I am 99% sure I like it. 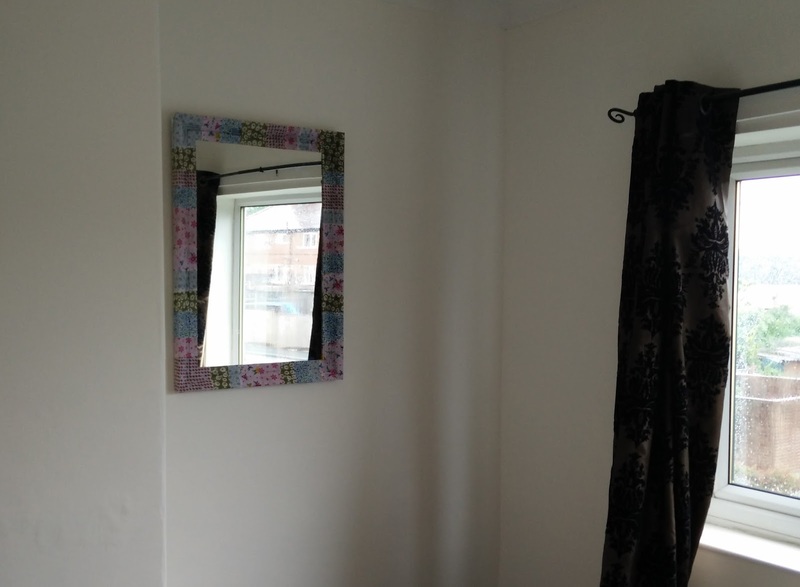 Taken as a solitary item yes it is probably a bit twee but as part of the room I think it works. 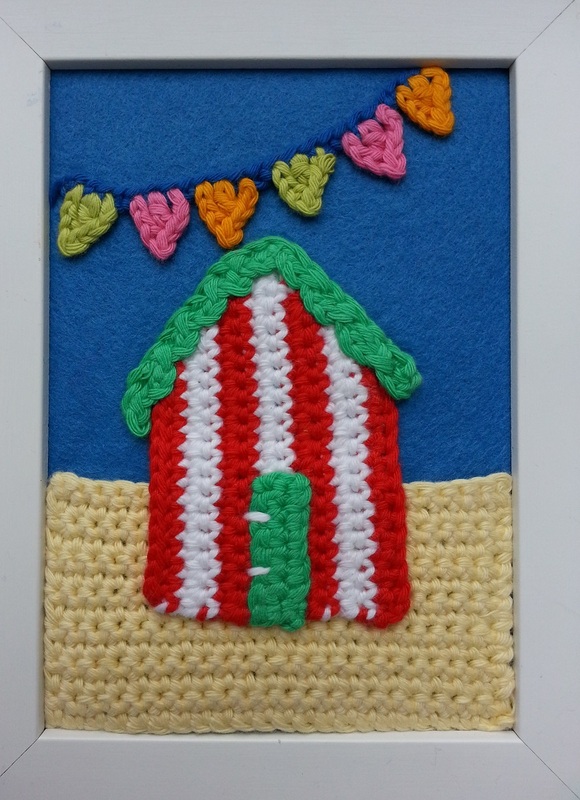 I have been beavering away being quite inventive and creative lately. 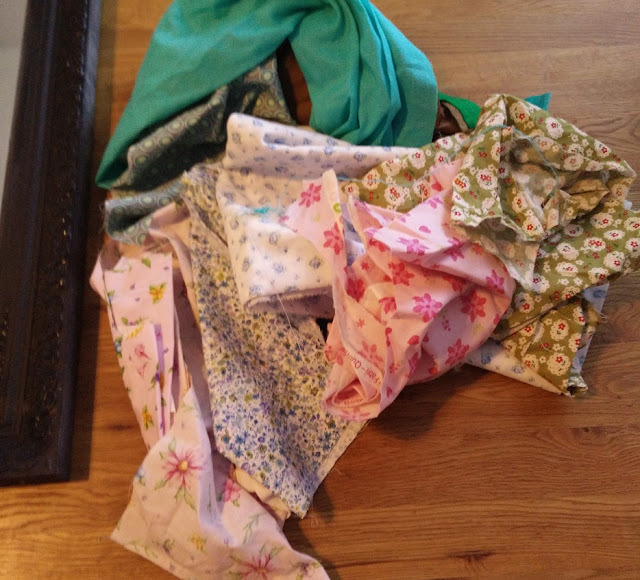 I have been asked to design a pattern but I have so many ideas I am not sure exactly where to begin! Obviously the first thing to consider is the yarn. Different types of fibre and weight are good for different types of things. 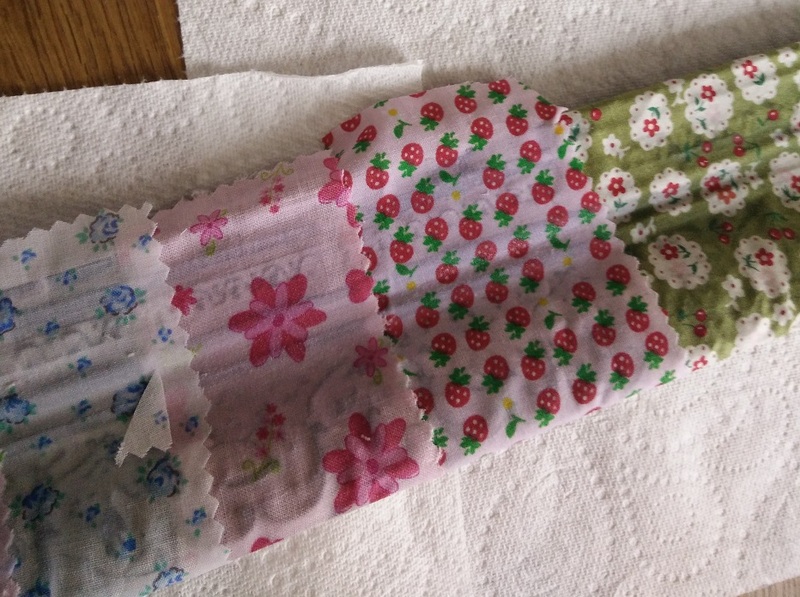 For example, I like cotton for things that need to hold a shape (flowers and decorations) as there is little give with it and it has a nice definite clear edge, no fuzziness. 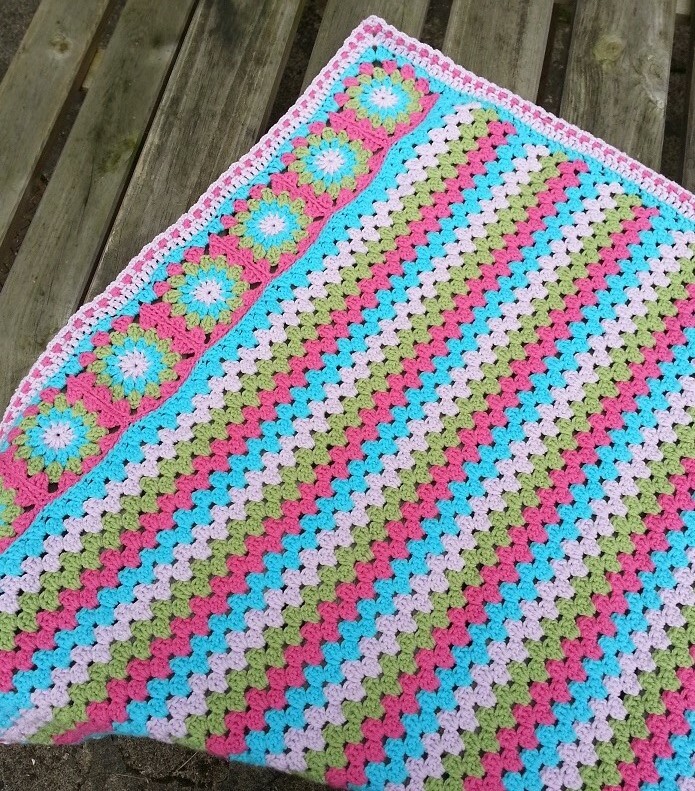 Acrylic mixes tend to work well for baby blankets as they wash well and keep their softness and woollier yarns tend to be good for garments and shawls. Of course most of the yarn I use is acrylic, it's cheap and the colours are limitless. 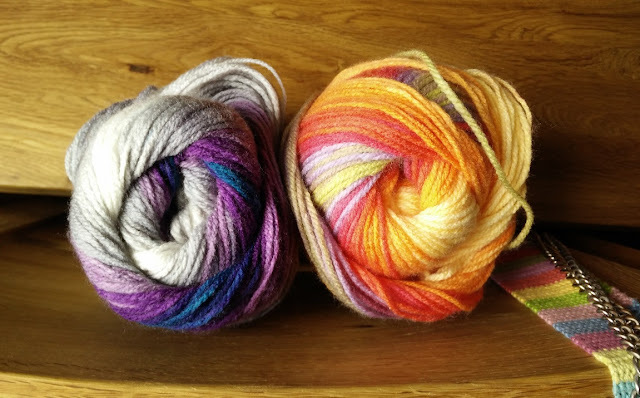 The yarn I will be using in my new project is acrylic and in these wonderful colours! Ooh so lovely. 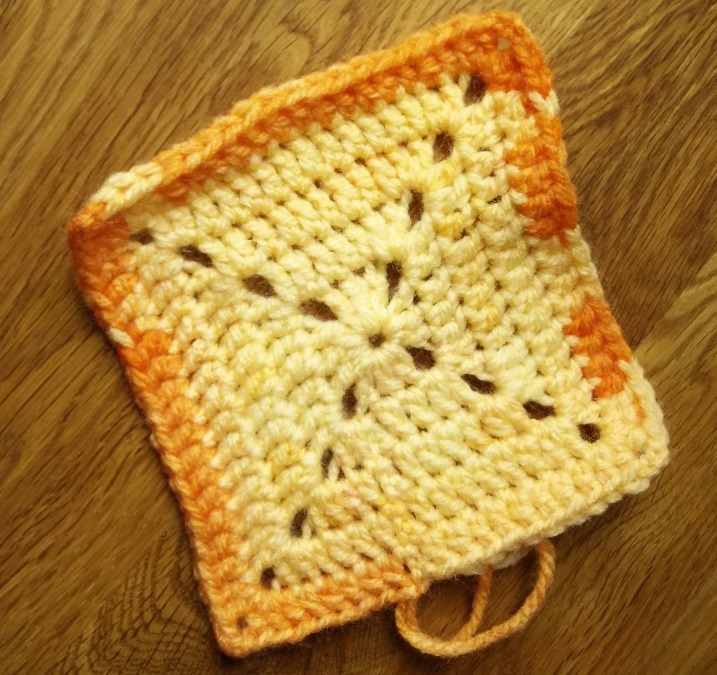 So first things first I decided to just start crocheting and see what the yarn was like to work with, what kind of fabric it made and how the colour would work up. This brings me to the title of this post, a new stitch! I was just randomly hooking up a flat circle but was getting annoyed by the gappiness of the usual 3 chain at the start of each row. I vaguely remembered reading about a way to avoid this a while ago by using a different stitch, so I took to Google to find out more. Standing stitches! 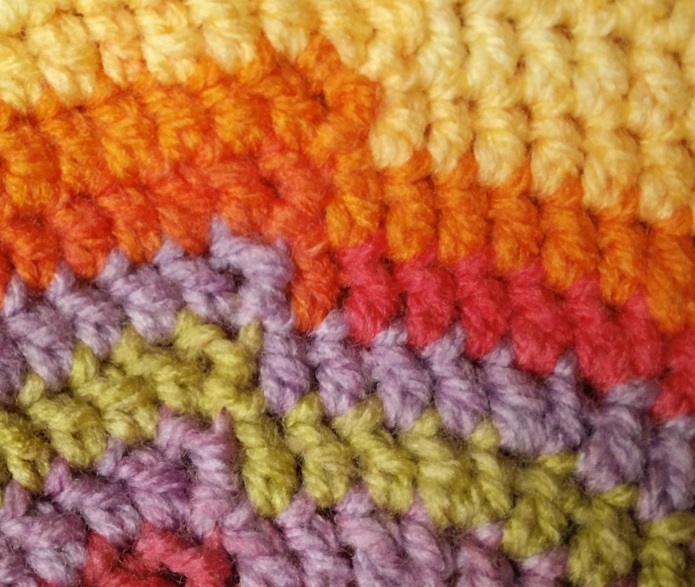 You basically create a treble stitch from the top down, ok it's not perfect but I am hoping with a bit of practice I get better at it and it is so much better than the usual chain 3 gaps. It’s still early days with this project but I am super excited to be making it, I just hope it turns out well!